Given that it is Christmas, this post has a slightly festive theme. It will explore the development of the cult of St Nicholas and the saints’ connections with medieval Ireland. St Nicholas was born in the 4th century and following his death, his cult developed and spread across the Christian world. He was a very important saint and was the patron saint of merchants, sailors, prisoners and children. Today he is venerated in both the Orthrodox and Catholic church. Over time his cult developed into the modern Santa Clause tradition. 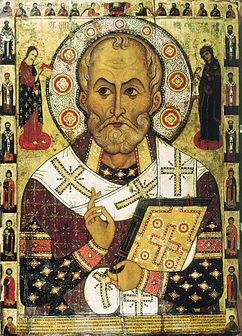 St Nicholas was born into a wealthy family in Asia Minor in a place called Patara (in the modern-day Turkey). 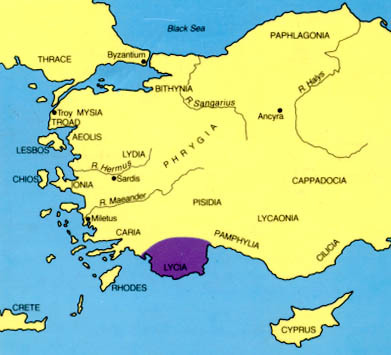 He became bishop of the port town of Myra in the territory of Lycia. The site of his grave soon attracted pilgrims and Myra became a thriving pilgrimage destination. 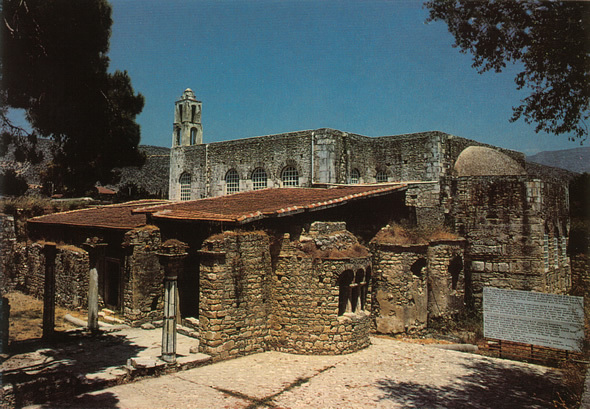 It is thought that the site of the saints grave is located within the 9th century church of St Nicholas on the outskirts of Myra. This church sits on an earlier 6th century church which tradition holds was built over the grave of the saint. 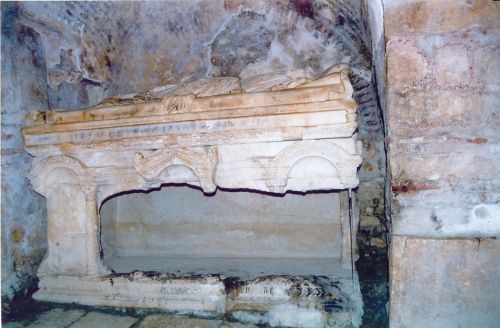 Within the present church , there is a sarcophagus which is thought to have held the remains of the saint. Throughout his life , St Nicholas performed many miracles and acts of kindness. 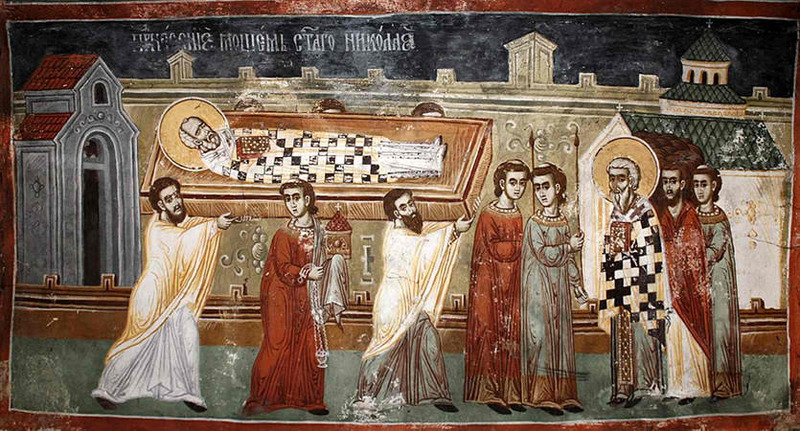 Fresco’s within the church depict scenes from the saints life, such as healing the sick and Nicholas saving the Basileios from the Arabs. The church at Myra remained a place of pilgrimage even after the remains of St. Nicholas were stolen in 1087 AD by Italian sailor from Bari and brought to the port town of Bari in Italy where they remain to this day. Tradition holds that in their haste the sailors left fragments of the body in the grave and these were collected by Venetian sailors during the first crusade and then brought to Venice. They were then placed in a church dedicated to the saint an on the Lido. Over the centuries there was much disagreement between Bari and Venice as to who had the true relic of the saint. Interestingly Professor of anatomy Luigi Martino at the University of Bari has examined both the remains at Bari and Venice and concluded that the fragments of bones in Venice were complementary to the bones in Bari. His investigations suggest that the bone are from the skeleton of the same man ( http://www.stnicholascenter.org/pages/relics-in-the-lido-of-venice/ ). So what of the saints connections with Ireland? The earliest evidence for the cult of St Nicholas in Ireland occurs in the Hiberno Norse town of Dublin. 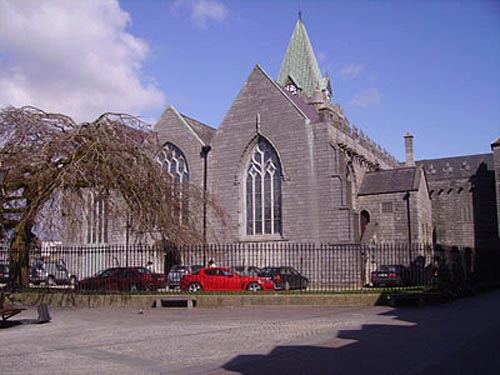 In 1038, Sigtrygg Silkbeard Olafsson, king of Dublin, with the support of Dúnán the bishop of the city, founded Christ Church Cathedral, with a chapel dedicated to St. Nicholas (Bairéad 2010). For a really interesting discussion on the introduction of the cult of St Nicholas to 11th century Dublin see Eoin Bairéad’s article Nicholas and Dublin reference given below. In the medieval period his cult was found in Gaelic and Norman communities alike. Dedications to St Nicholas are found attached to holy wells and medieval parish churches across the entire island of Ireland. At present I am putting together a database of all medieval sites dedicated to the saint. Hopefully by this time next year I will be able to share more information on the distribution of the cult in Ireland. One of the most beautiful medieval churches dedicated to St Nicholas in Ireland is the medieval collegiate church in Galway city. Churches and chapels dedicated to the saint are also found in the port towns of Drogheda and Waterford. Additional dedications are found at Dunsany Co Meath, Clonmel, Co Tipperary and Newtown Jerpoint Co Kilkenny. Holy wells dedicated to the saint are found in the counties of Kerry, Limerick , Meath and Waterford . Given the popularity of St Nicholas I see no reason why Irish pilgrims to Rome or Jerusalem would not have visited Bari or Venice. The Via Francigena was one of the main pilgrim routes to Rome and from Rome it continued south to the port of Bari. Bari was also one of the departure points for the Holy Land and the Church of the Holy Sepulcher in Jerusalem. 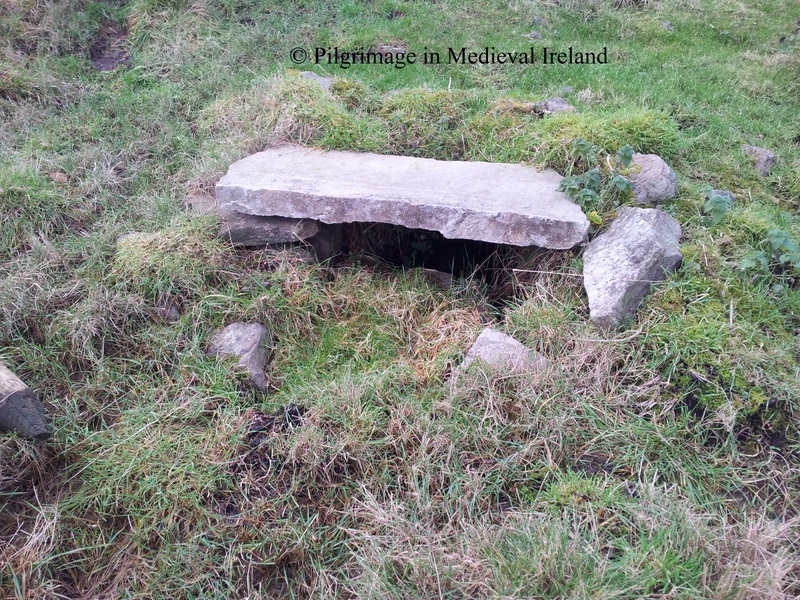 Within Ireland local pilgrimages were made to holy wells dedicated to the saint across the country. I hope to discuss these pilgrimages further in another blog post. Located close to the great Cistercian foundation of Jerpoint Abbey. The medieval town of Newtown Jerpoint was founded c.1200, shortly afterwards a church dedicated to St Nicholas was built to cater for the towns growing population. The town fell out of use in the 17th century. The remains of the town are preserved today as a series of earthworks but the guided tour really makes the landscape come alive and you get a real sence of what the town was like . So what of the sites connection with pilgrimage? Although extensive records for the town’s history exist there are no references to medieval pilgrimage here however tentative evidence may be suggested by the tradition that St Nicholas of Myra was buried here. The Newtown Jerpoint conservation plan notes that ‘according to local legend , there had been fourteen wine-taverns among the trading establishments of Jerpoint.’ There are some who think that the large amount of taverns may have existed to cater for pilgrims. So tradition holds that St Nicholas’s grave is marked by a large medieval grave slab. 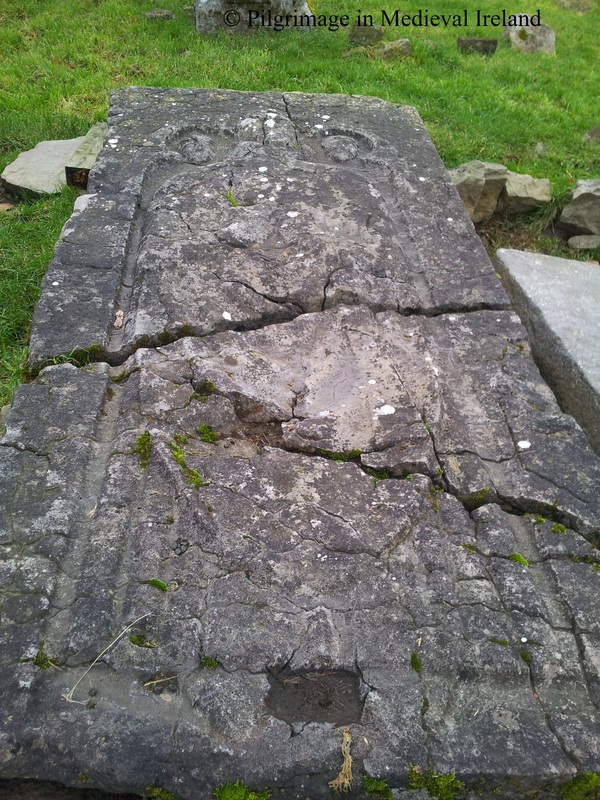 The slab has been dated to the early 14th century by John Hunt (1974, 197). The slab has an effigy of a cleric dressed in a full chasuble (outermost liturgical vestment worn by clergy), his hands are raised palm-outwards on his chest. On his feet are pointed shoes. Above each shoulder are two heads one wearing a mitre-like head-dress and the other a pill-box type head-dress. Local tradition holds that this figure depicts St Nicholas and the heads are two crusaders who brought the saints remains back to Ireland. The tale tells of a band of Irish-Norman knights from Jerpoint, traveling to the Holy Land to take part in the Crusades. On their return home to Ireland, they seized St Nicholas’ remains, bringing them back to Kilkenny, where the bones were buried. Another version of the story tells of a French family, the de Frainets, who removed Nicholas’ remains from Myra to Bari , in 1169 when Bari was under the Normans. The de Frainets were crusaders to the Holy Land and also owned land in Thomastown, Ireland. After the Normans were forced out of Bari, the de Frainets moved to Nice, France, taking the relics with them. When Normans lost power in France, the Nicholas de Frainets packed up once again, moving to Ireland. This story has the relics being buried in Jerpoint in 1200. Like all legends there is probably some truth to this. I think it is unlikely that the body of St Nicholas was brought here, if it had such an important saint would most certainly have been placed in an elaborate shrine (most likely within the church). However it is my opinion that the church was in possession of one if not two corporeal relics of St Nicholas. Norman knights from Kilkenny did participated in the Crusades to the Holy Land so it is possible one or two of them brought some relics back with them. I think that over time this legend developed and attached itself to the near by burial slab which most likely depicts a cleric associated with the church or nearby Jerpoint abbey. 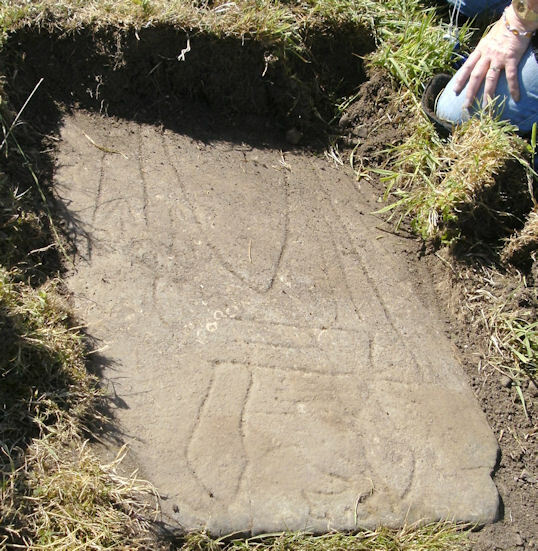 Recently a second grave slab of a similar date has been uncovered at the site and it also depicts a cleric. Any church in the possession of a relic (s) had the potential of attracting pilgrims and I see no reason why pilgrims would not have come here to pray to St Nicholas. A holy well located a short distance from the church, also dedicated to St Nicholas was another possible point of devotion and there was a tradition that the water was a cure for skin complaints. Even if St Nicholas is not buried here Newtown Jerpoint is a very special place. The sites owner Joe told me he feels a strong connection with St Nicholas and the site and he suspects the saint is buried here. He also told me that since the site has been open to the public there have been many happy coincident which have connected people, the saint and the site. 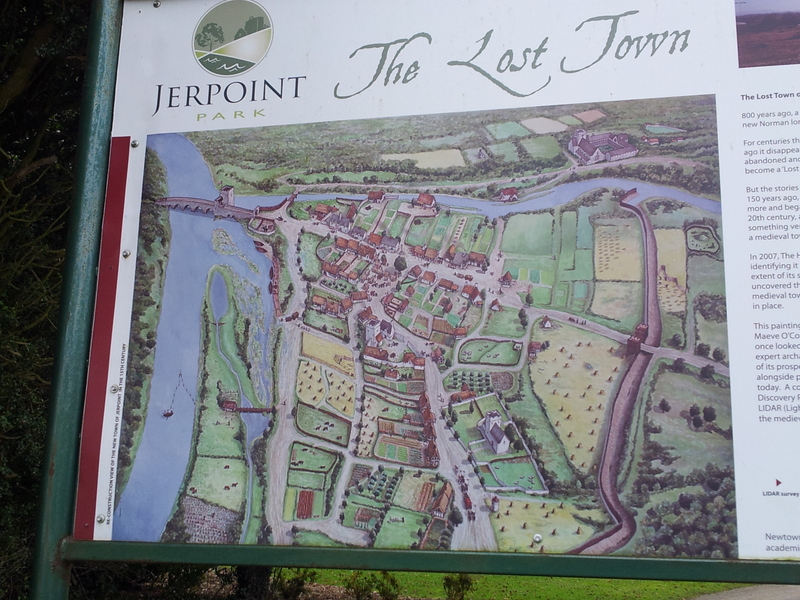 So if you get the time take a visit to Newtown Jerpoint. Bairéad, E. 2010. ‘Nicholas and Dublin’, In eds. Davies, M., MacConville, U. & Cooney, G. A grand gallimaufry: collected in honour of Nick Maxwell. Dublin: Wordwell. Hunt, J. 1974. Irish Medieval Figure Sculpture. 1200-1600. Irish University Press. 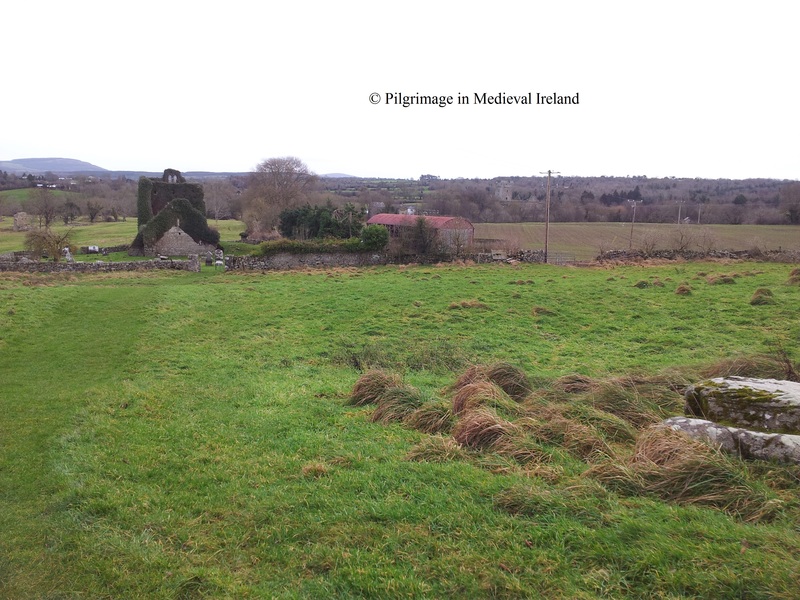 This entry was posted in Medieval Church, Medieval Pilgrimage, Uncategorized and tagged medieval pilgrimage, medieval pilgrimage in Ireland, Newtown Jerpoint, Pilgrimage Kilkenny, St Nicholas of Myra, St Nicholas's cult in Ireland.